We wrote earlier about one of our favorite style icons, Audrey Hepburn, who, in Breakfast at Tiffany’s, introduced the little black dress to the world in a way that ensured its continuing popularity decades later. While we were writing the article it occurred to us that ‘the’ black dress wasn’t the only contibution to the fashion world made by Hepburn in the movie. In fact, just a few inches or so from the top of that fantastic dress came a second revelation: the signature Audrey Hepburn sunglasses that completed (and complimented) many of her outfits through the movie. In the years since Breakfast at Tiffany’s hit our screens we’ve seen the same erroneous claim made time and time again by those supposedly in the know: Hepburn’s sunglasses were Ray Ban Wayfarers. … And below you’ll see a pair of Ray Ban Wayfarers, my favorite frames of all time (not a great revelation, as Wayfarers have to be in the top ten best selling – and best reviewed – sunglasses in history). They’re the same, right? Wrong. Look at the plunging nose piece on Hepburn’s sunglasses. The Wayfarer nose piece has a much more subtle curve, dipping gently at the nose. Hepburn’s shades scream out for attention. 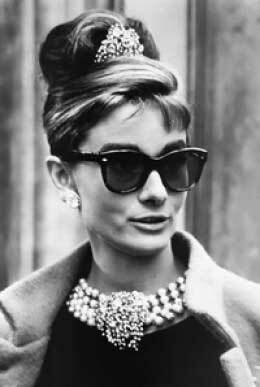 So what are those famous sunglasses perched on the ever so pretty face of Holly Golightly? Glad you asked. They’re a frame called the Manhattan made by Oliver Goldsmith, the highest of high end purveyors of quality eyewear. The Manhattan was re-released in 2011 to commemorate the 50th anniversary of Breakfast at Tiffany’s. Good look finding a pair, though. These things are like gold dust, and they come with a price tag so steep that you’ll need a couple of bricks of the stuff to grab a pair. By the way, lovers of screen accuracy should note that Hepburn wore tortoiseshell frames with crystal green lenses. I have a couple of pairs of Wayfarers in the same style, and I can’t recommend them more highly. So, you’d like a pair of Audrey Hepburn sunglasses for that ever so perfect Breakfast at Tiffany’s look? Well, while it may not be practical to splash out on a pair of the Oliver Goldsmith originals there are plenty of frames that emulate the look. The most obvious frame, of course, is the classic Wayfarer. While the styling may be slightly different there’s no doubt that the Wayfarer is a design classic, as well as a high quality frame that should last a lifetime (provided you don’t leave them in a cab, as I am wont to do). Now, I’m about to recommend a few cheap and cheerful frames that emulate the Audrey Hepburn look, but before I do I want to warn you that I’m breaking my own long standing rules about buying sunglasses in doing so. Right now I live in Mongolia, and until recently I lived in Thailand, and on the streets of both of these countries you can buy a pair of fake Ray Bans for less than $5. My own pair of Wayfarers are genuine, and they cost me about $150 in a Bangkok department store. My girlfriend, however, wears fake Aviators she buys on the street, but because the quality of these knock off frames is so atrociously poor they break when you so much as look at them. In the last couple of years she’s surely spent more than $150 on sunglasses. Cheap frames are a false economy, is what I’m saying. So, before I recommend these inexpensive Audrey Hepburn sunglasses I beg you to just go out and buy a pair of genuine Wayfarers. If you treat them with care they’ll outlive you.